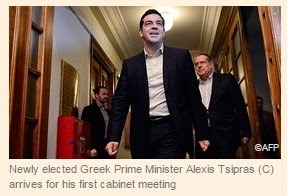 Μονταζιέρα: Financial Times:Can Athens re-write the bailout rules? But Mr Tsipras’ government has tossed out this game plan. They now appear ready to let the bailout expire in February without an extension or a new line of credit in place. They have signalled they want only €1.9bn from the last bailout tranche, which suggests they will ditch the IMF. Instead, Yanis Varoufakis, the new finance minister, said Athens is preparing a new plan it present to the EU next month, which will include less austerity and a restructuring of Greece’s national debt. He believes Athens has until June — when the first of two big bond payments are due — to negotiate a new “contract” with Greece’s bailout lenders. Q: Why is the government throwing out the playbook when the bailout is so close to completion? Mr Tsipras believes the whole bailout process, where Greek taxpayers have been squeezed to pay off bondholders and bailout lenders, is not only morally unjustified, but has actually contributed to Greece’s malaise. The country has endured a far deeper recession than bailout monitors predicted and the tough austerity measures probably made it worse. It would be a big climbdown for the new government to ask even for a “technical” extension of the bailout for a few months while it comes up with its own plan. It certainly does not want to push through reforms required by the troika to complete the programme. Q: Is there room for a deal? Most EU officials believe there is, if Mr Tsipras and Mr Varoufakis tone down their rhetoric and scale back their debt cancellation objectives. There is broad agreement that EU bailout loans to Greece can be paid off over a longer period of time, lowering their net present value. And leaders may be willing to lower the budget surplus targets Athens is required to hit, giving Mr Tsipras some cash to spend on social programmes he has promised. But EU officials are pretty adamant Athens still needs to reform its economy more broadly, so the ball is in Mr Tsipras’ court. 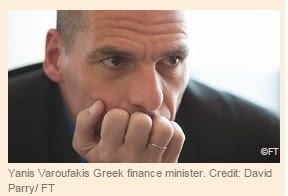 Can he present a plan that promises legitimate reforms EU lenders can monitor and enforce? If so, some may be willing to strike a deal. But there is also widespread opposition. Normally, it is a German-led group of northern countries which drive the hard bargain. But now they have support in the south. Spain does not want to see a far-left party succeed when they are under threat at home from a similar party, Podemos. Portugal and Ireland, which successfully implemented rigorous bailouts, do not want to be made out as fools for abiding by the rules when Greece gets to reset them. Q: What are the dangers? The most immediate danger is what happens if the bailout programme lapses on February 28, leaving Athens without access to emergency funds for the first time since May 2010? Most officials believe it can scrape together enough cash to pay about €4.3bn owed to the IMF next month, but funds are running low, particularly since many Greeks stopped paying taxes in anticipation of a Tsipras win. The Greek government could very well run out of money in a couple of months. More immediately, some EU officials worry that withdrawals from Greek banks, which accelerated significantly during the election campaign as savers began to panic, could increase if the bailout lapses, undermining Greece’s already shaky banking system. That would mean the ECB would be called on to approve emergency funding to Greek banks – but it is unclear whether Greek banks would remain eligible for emergency funding if Athens is not part of a programme. Without such liquidity funding, a run on Greek banks could be the “accident” that forces Greece out of the euro since it Athens could end up having to print its own currency to rescue its financial system from total collapse.